I think 2017 may just be the year I found my holy grail foundation. I can't believe how late to the party I was with trying this out. Read my full review though, so see why I think it is so fab. I didn't even think about how much I love this product until I realised it's been in my bag everyday since I got it, and it also lives next to my bed. And when it isn't within arms reach I start to panic. I use this everyday as a lip balm, but it can be used for so many different uses too. This is probably one of the most talked about beauty products this year, and I'm not surprised. I've never found a product like it before. It really is a game changer when it comes to amazing brows. Plus, don't for get that if you're a first time Glossier customer you can get 10% off. It's not a surprise that this gets a mention. I've never used a concealer like this before (and I like to think of myself as a bit of a concealer connoisseur). Again, don't for get that if you're a first time Glossier customer you can get 10% off your first purchase. This is another product I can't believe it's taken me so long to try. When I got it, I thought it would very much be a summer product, but I've found myself reaching for it during the autumn and winter too. Also, It's definitely a product for everyone, whatever your skin type or concern. This year had been the year of the sponge for me. I've hardly used a brush to apply my foundation or concealer this year and there's no going back now. There is no way I will ever spend money on a Beauty Blender, when there are so many amazing affordable ones out there. I hate all things haircare, so am always on the hunt for products that make my hair look as good as possible, as quick as possible. And this hairdryer does exactly that. It basically styles your hair, whilst drying it. I'm pretty sure I mentioned it in last years yearly faves, but I can't not mention it again. Lots of people have banged on about this product this year. I absolutely love it, however I have found that I used it so much more over the spring and summer, when I wear less makeup. This year I completely became obsessed with my Tangle Teezer all over again. No hairbrush will ever compare for me. Like I said about the New Look sponges, I'm completely converted when it comes to beauty sponges, and actually think the Real Techniques ones are the best, as well as being really affordable. 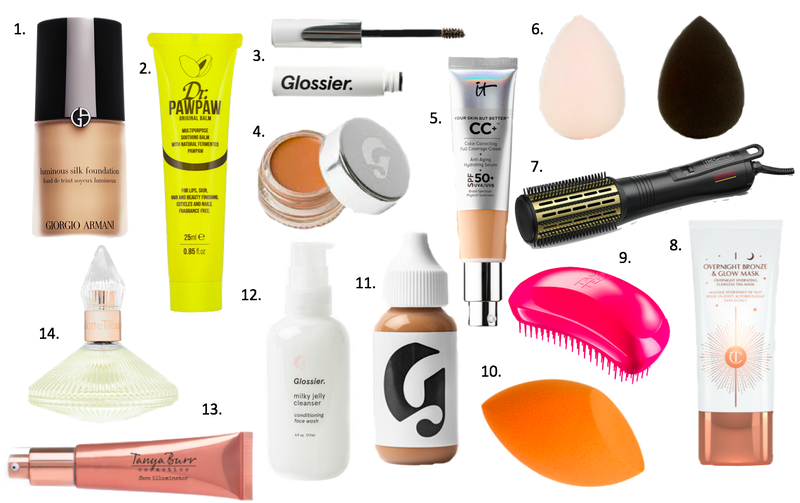 Despite falling in love with the Armani foundation, this year for me has been a year of less is more when it comes to makeup, and I've been loving less coverage products. This is the perfect product for that no makeup, makeup look. Without a doubt my number 1 skincare product of 2017. It's nothing fancy, but I find that so many products at the moment try to do to much. This is a gorgeous, no fuss, gentle cleanser, that leaves my skin feeling so clean, and fresh. I know I've mentioned this already, but please don't forget that if you're new to Glossier you can get 10% off. This is a great dupe for the Charlotte Tilbury Wonderglow. I love to either slather this all over my face under my base, or mix it with whatever I'm using for my base and it creates the most beautiful glowy skin, without looking glittery or shiny. This has been my fragrance of the year. It is the most dreamy scent, and really unique too. It's also really strong, so a little goes a long way. I've used this loads this year and I'm not even half way through the bottle yet. Definitely worth the slight splurge. If you like this post please follow me on Bloglovin' to keep up with all my new posts. It means a lot! © Molly Hutch | All rights reserved.